What the hell is spin? In this week's "Ask a Physicist" we get a little salty and explore the ins and outs of quantum spin. Also, why your intuition will betray you at the slightest provocation and why it's awesome to be made of fermions. He's right to be all worked up. Spin is one of those weird things in quantum mechanics that sounds so much like something from your ordinary experience that you might be tempted to think your intuition will help you out, but it won't. In fact, your intuition is much more likely to knee you in the groin and steal your girl. Don't trust it for a moment. So first off, all particles have a fundamental spin. Just like electric charge or mass, spin helps to define which type of particle is which. Alasdair did a really nice write-up of the standard model not too long ago, and a follow-up about particles that we might soon detect. The upshot is that some particles, like electrons, positrons, and quarks (also protons and neutrons, even though they're not fundamental, but instead are made of quarks) have a spin of 1/2. They're known as "fermions." Others, like photons, gluons, and the W and Z particles, have a spin of 1. They're known as "bosons." It turns out that fermions and bosons behave very differently from one another. It's kind of like a little gyroscope, but not really. I'm going to focus on electrons, because if you understand spin in electrons, you're in pretty good shape. 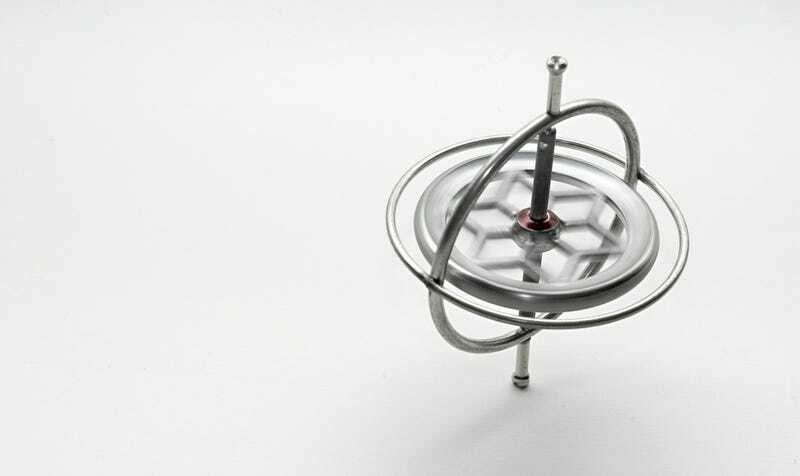 You could imagine that the electron is like a miniature gyroscope, at least for starters. It spins and spins, never slowing down. No matter what you do to it, you can't speed up or slow down a spinning electron; you can just change its orientation. No matter what you do, an electron always has a spin of 1/2. But 1/2 of what? A number known as "the reduced Planck constant." This is an incredibly tiny number. To give you an idea, the second hand on a grandfather clock has an angular momentum about 1029 times larger. That's weird fact number one. After all, you normally can slow down spinning bodies. Superman could stop the rotation of the earth, for instance. In another sense, it's exactly like a little spinning gyroscope. Angular momentum is one of those conserved quantities that physicists swoon over. By changing the direction of an electron spin, angular momentum does get transferred elsewhere, like to the orbit or to another electron. Because an electron has charge, and because it's "spinning," it creates a little magnetic field. That's how an electromagnet works. We can detect the electron's magnetic field, or deflect individual electrons using other magnets to figure out which direction the electron is spinning. The magnetic field is all wrong. Take a little ball of charge and spin it. You'll create a magnet. No matter how big or small you make the ball, it turns out that the magnetic field is an exactly predictable multiple of the angular momentum. There's just a bunch of constants involving the charge and the mass of the ball, but not the size. The problem is that if we imagine an electron the same way, this procedure doesn't work out at all. The magnetic field is a factor of 2 too large. Actually, it's more like 2.0023193044. This number has actually been measured to this insane level of precision and also calculated theoretically. Apparently we're on to something with this whole "quantum field theory" because damn! we make some accurate predictions. Weird fact number two is that you absolutely can't think of the electron as a little microscopic charged sphere. The numbers just come out wrong. Spin can't be pointed in any old direction. Even though electrons have a fixed spin, you might suppose that the component of the spin in a particular direction can be any old value we like. Think of it this way: suppose I had a meter stick (length=1 meter), and rested one end of the stick on the ground and the top end at an angle. You could measure the height of the top end off the ground and, depending on the angle, you'd get somewhere between 0 and 1 meters. Likewise, the earth is spinning, but if you've ever seen a globe, you'll know that it's tilted at an angle of about 23 1/2 degrees relative to the orbital plane. In other words, if you measured the "up-down" spin of the earth, you'd get something less than the total, since it's also got a bit of "side-to-side" spin going on. But this doesn't work with electrons. If you set up a little magnetic field to deflect them, you either get that a particular electron is either 100% spinning up, or 100% down, never in between. Stranger still, it doesn't matter which way you turn your measuring apparatus, you'll always get the same basic result, either one direction or the other, never in the middle. And here's where weird fact number three comes in. Suppose you do measure an electron as spin up, and then try to measure the left-right spin. Common sense would tell you that that number would be zero, since you know that the electron is spin up, not left or right, but I warned you about common sense before. It turns out that a) half the time you'll measure the electron to be left and the other half you'll get right, and b) whether it's left or right is completely random. Really. Nothing in the universe could have told you which the electron would pick. This sort of randomness really pissed Einstein off (remember the bit about God not throwing dice). You have to turn electrons around twice to make them look the "same." In the past, I've talked a bit about the wave-functions of particles. The square of the wave-function tells you the probability of finding a particle in a particular place at a particular time. What's strange about electrons — and all spin 1/2 particles — if that if you turn the entire universe around 360 degrees, the wave-function gets a minus sign in front of it. How Smart Do You Need To Be To Collapse A Wave Function? That's weird fact number four. You have to turn an electron around twice before it looks the same as it started. It doesn't seem like we should care about this. After all, since we only worry about the square of the wave-function, a minus sign doesn't do anything. The square of -2 is the same as the square of 2. Imagine two electrons with their spins in the same direction, one exactly on top of another (and for those experts reading this, they both have the same momentum as well). Now imagine swapping them. To us, nothing seems to have changed, but to quantum mechanics, the whole universe is now in chaos. The wave-function shouldn't change at all, since there's no distinguishing one electron from another, but somehow we're suppose to put a minus sign in front. To recap: Change nothing, but also multiply by -1. The only number that that works for is 0. In other words, 0 wave-function, so 0 probability, or no chance whatsoever. The other way of saying this is that electrons (and all fermions: quarks, positrons, neutrinos, etc.) cannot be in the same place with the same spin as one another. This is the famous "Pauli Exclusion Principle." It predicts that electrons in atoms can't all be in the same state, but instead need to be in different orbitals. If this weren't the case, everything could be in the lowest level, and all elements would behave pretty much like hydrogen. Boring! (and not conducive your existence). Bosons, the other sort of particle, don't work this way. Swap two bosons, and you don't change anything. Turn a boson around just once, and everything returns to normal. They're spin 1, which is basically just a fancy way of saying that they behave the way you'd expect. Those are just the bosons we've discovered so far. The Higgs (if it exists) is spin 0, and the graviton (if it exists) is spin 2, but we can ignore those today. A boson likes (so far as a subatomic particle can like anything) being in the same place and spin as its brethren. This is why we're able to get Bose-Einstein condensates, which is basically a bunch of bosons in a single state. The point is that spin isn't just weird, although it is. The point is that spin is much more at the center of how things work than you might possibly have suspected. Dave Goldberg would like to remind you that his book with Jeff Blomquist, "A User's Guide to the Universe: Surviving the Perils of Black Holes, Time Paradoxes, and Quantum Uncertainty," is available on amazon, and would make a great present this holiday season. Follow him on twitter, facebook or his blog, and most definitely ask him questions. He is an Associate Professor of Physics at Drexel University.